Coming in April is Bond No. 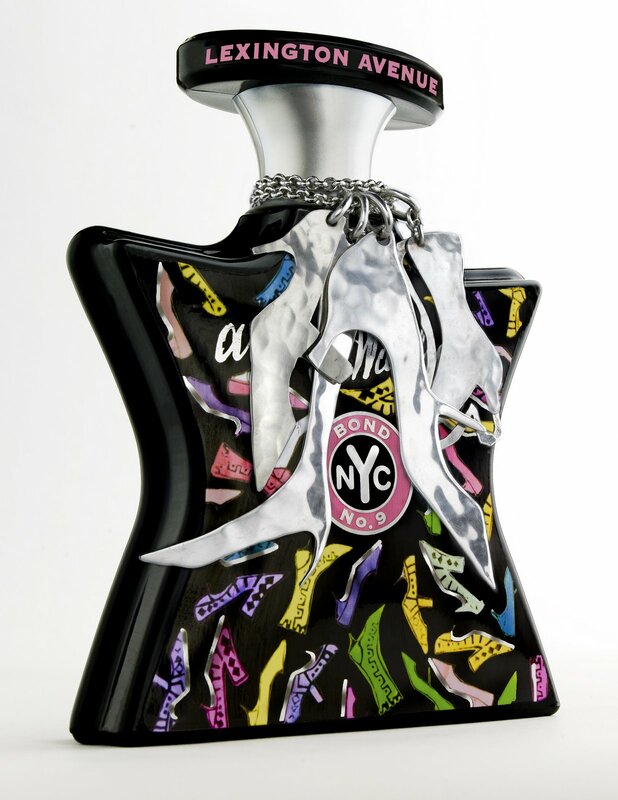 9 Astor Place, a fragrance inspired by New York’s most vibrant arts and style intersection. The flacon echoes the angles and cubes of the Rosenthal sculpture, the famous marker of neighborhood,and renders them in an array of rich colors. The golden background pays homage to the Astor fortune and philanthropy. And the scent? Downtown meets uptown in a seductive and fresh freesia-poppy-violet leaf composition that dries down into smooth notes of teakwood and musk. I can honestly say that I LOVE LOVE LOVE the smell of Astor Place. I’m not entirely crazy about the gaudy gold flacon, but the top notes of violet leaf and mandarin zest, middle notes of freesia, red poppy buds and iris root, and bottom notes of teakwood, musk and amber combine to form something magical–fresh, springy, feminine, ligh and seductive. It’s a light citrusy floral and the sweetness is nicely balanced by the greeness of the violet leaf. Definitely something that’s going on my spring wish list as this may be my new favorite fragrance. From Bond No. 9: When we introduced our latest fragrance, Brooklyn, last month, its breakthrough street-art surface design brought praise and a barrage of responses. Well, we already knew that aficionados of the borough of Brooklyn can be opinionated. But so many strong opinions reached us about what a Brooklyn bottle could look like that we realized we’d better offer more options if we knew what was good for us. So throughout March 2009, Bond No. 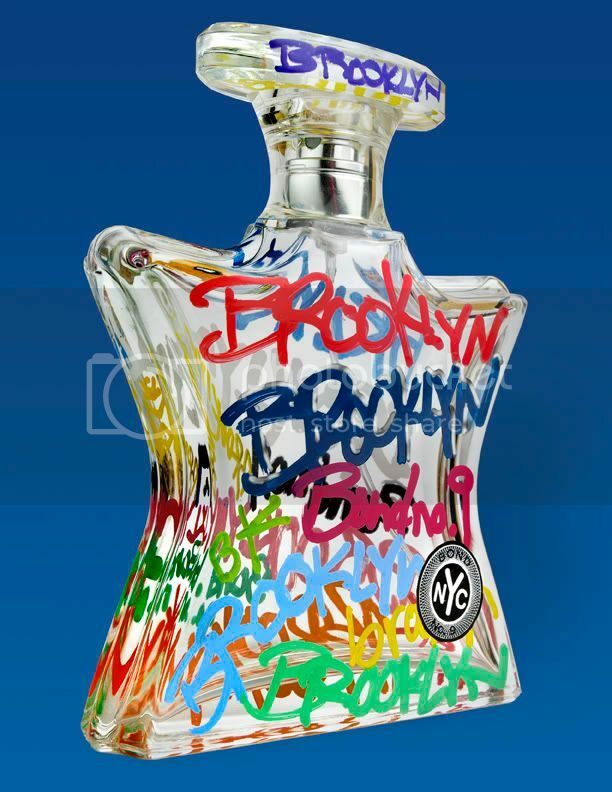 9 is inviting everyone (amateurs and artists alike) to join in on their Brooklyn Bottle Design Competition, and to create a bottle design for their this contemporary, male-oriented carndmom-cedarwood eau de parum. If I were even remotely artistic I would totally enter this contest, but alas the full extent of my artistic prowess is limited to drawing sad little stick figures. Create your design to fit within the outline of the Bond No. 9 flacon and to include Bond No. 9’s circular “token” logo (see bottle outline below). Any style, figurative or abstract, is fine. After two winners are chosen in early April, Bond No. 9 will put the victorious designs into production, with the winner’s names displayed on the bottles. Each winner will also receive one bottle of Brooklyn per month for a year. I just recently discovered that for $15 (including shipping) you can order a set of 6 beautifully wrapped Bond No. 9 samples to test out for yourself. Needless to say I’ll be trying pretty much everything. 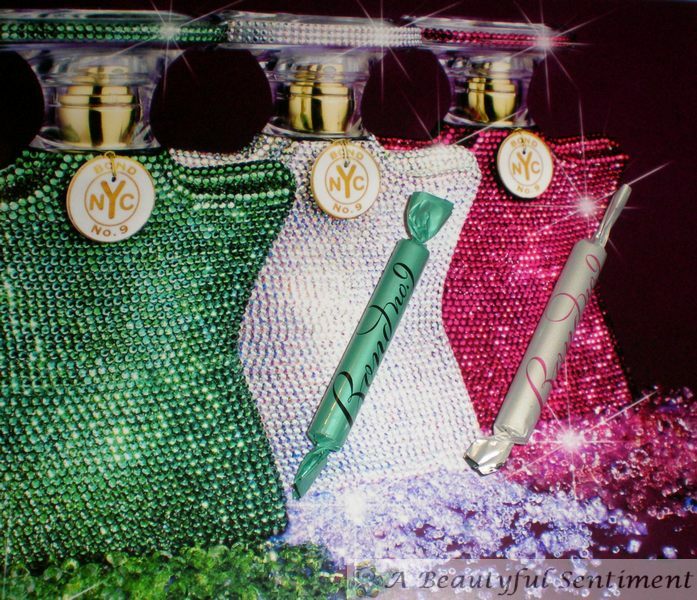 So while all of the fragrances that were “crystallized” for Bond No. 9’s Holiday release are a part of their permanent collection, I thought I’d review two for you. Chinatown: Bond No. 9 fittingly decked out my favorite perfume out of the Swarovski All Stars in fuchsia/ruby colored rhinestones. Yep you guessed it–Chinatown! The notes in Chinatown are peach, gardenia, tuberose, and sandalwood and they come together to form a masterpiece of a fragrance. It’s sweet yet spicy, bold yet elegant. The top note of peach blossoms is fleeting, drying down to a vanilla-y incense-y scent. The staying power isn’t amazing, but nevertheless it’s a wonderful fragrance. 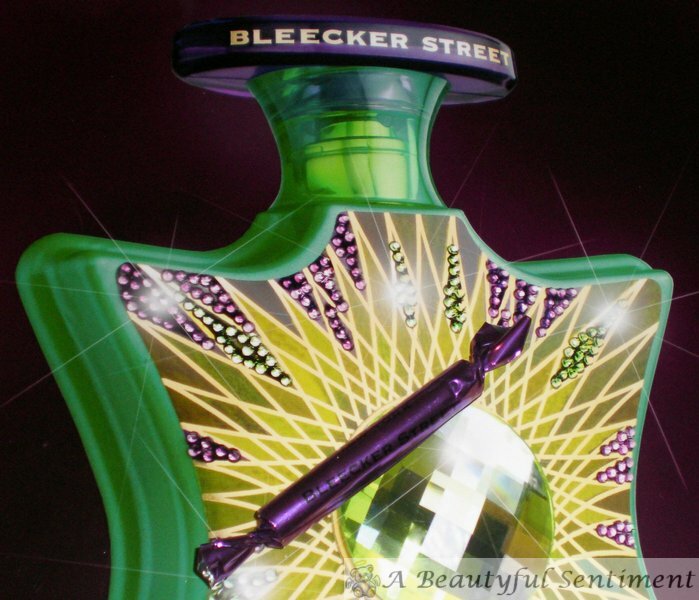 Bleecker Street: Bleecker Street, while an interesting fragrance, really isn’t one of my favorites. I think that I’d prefer to smell this on a man–the mingling of violet leaf, cassis, jasmine, cinnamon, and oakmoss create a rather strong fresh green/herbal scent that doesn’t do so well with my body chemistry. The opening note is intensely green and almost tart, but the dry down is warm and musky. I’m off to search for a man to try this out on lol! Holiday 2008 at Bond No. 9 goes from understated to shamelessly luxurious. Check out your own little sneak peek at these stunning crystallized flacons! And click HERE for even more crystallized Bond No. 9 fragrances. Bond No. 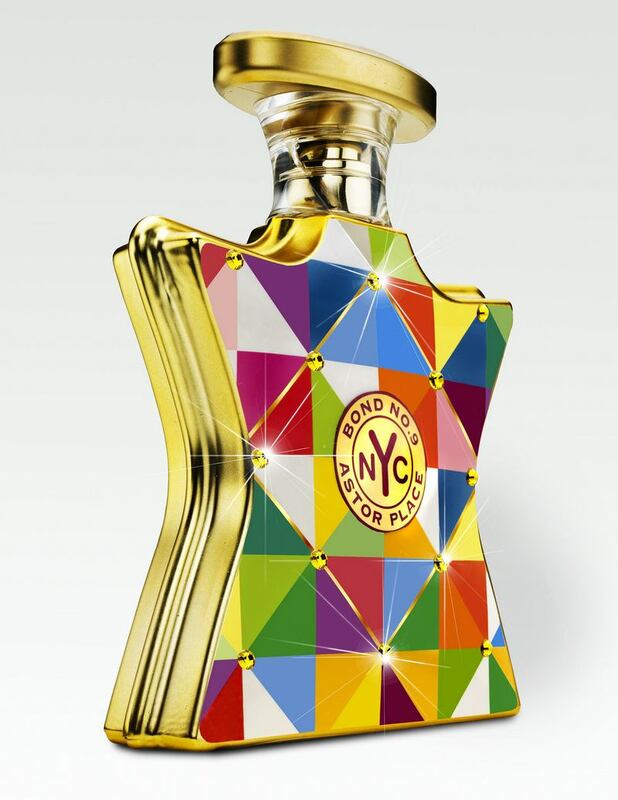 9 chose Bleecker Street (a gourmand oriental mingling of patchouli, cassis, caramel, woods, and musk) to receive its annual “Swarovski treatment,” and what a treatment it is! Okay so admittedly the bottle reminds me a bit of a Teenage Mutant Ninja Turtle, but only in the best possible way of course! 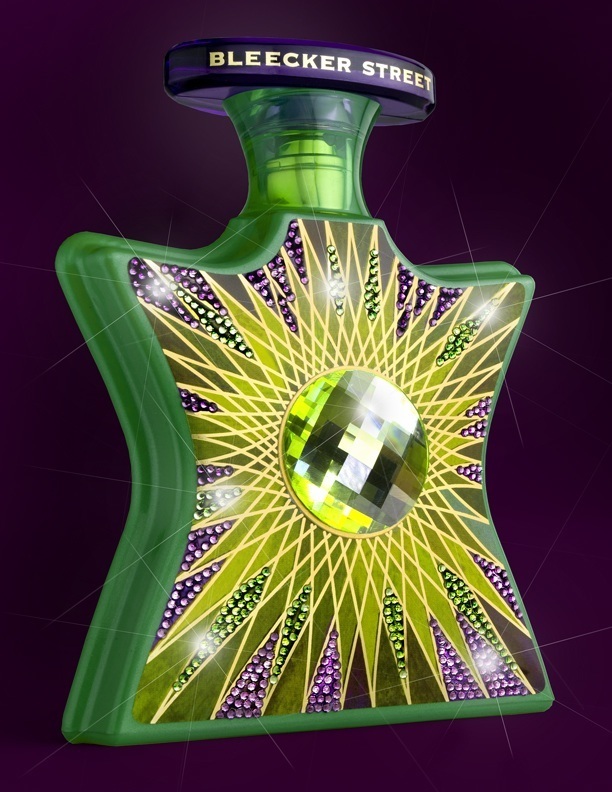 The limited-edition 100ml lime green-chartreuse-amethyst-gold starburst watercolor flacon is studded back and front with a checkerboard pattern of matching crystals, with an extra large crystal front and center for good measure. The price for all this beauty? $395. Bond No. 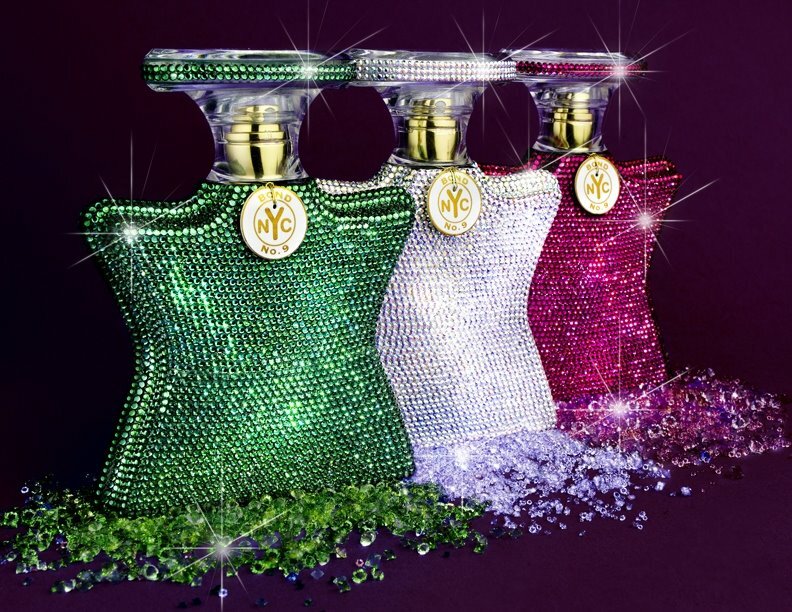 9 has embellished three of their most coveted scents with Swarovski crystals–5,000 of them per 50ml bottle to be precise! Chelsea Flower (peonies-magnolia-rose) is decked with emerald-colored stons, Eau de New York (citruses-cyclamen-jasmine-vetiver) is studded with diamond-colored aurora borealis stones, and Chinatown (peach-gardenia-tuberose-sandalwood) features ruby-colored stones. I’m thinking somebody needs to these for me as a holiday gift–after all they go so well with my clutch! And finally we get to the show-stopper of the holiday collection-the item that’s at the top of my “I must have it! !” list! It’s none other than Bond No. 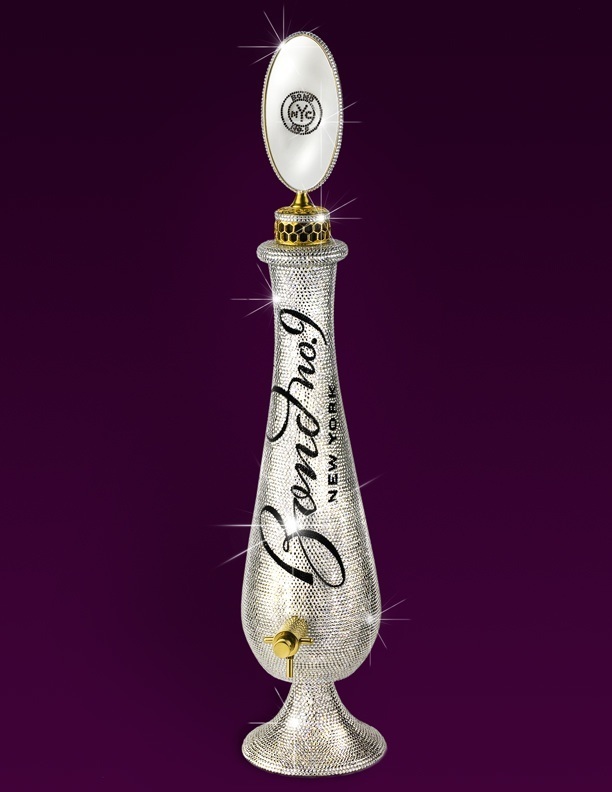 9’s super-sized 42 oz amphora vitrine, breathtakingly covered with 16,500 hand-applied platinum Swarovski stones. And the bottle top? An elliptical mirror with honeycomb base. Your $3,500 gets you this heart-wrenchingly gorgeous amphora filled with your choice of the 32 Bond No. 9 scents. My choice? The Scent of Peace. And all this beauty comes in a white patent leather gift case, also adorned with crystals. If it’s wrong to want to get this then I don’t want to be right! Remember when I mentioned wanting to test out Bond No. 9’s latest fragrance release here? I mean how can a girl resist a gorgeous flacon adorned with a myriad of colored shoes? Well I finally got around to testing it, and I have to admit I was very pleased. After checking out the notes of this fragrance (see them here), I was left wondering if Lexington Avenue wouldn’t be too woodsy/earthy for me, although I did love the middle notes (creme brulee, pink peony–yum!!). Lexington Avenue turned out to be a wonderful, heady, rich fragrance that I find strangely comforting. A spritz of this reminds me of when I was a little girl, standing by my mother watching her get dressed up to go to an event. She’d curl her hair, do her makeup and then walk through a small cloud of fragrance as a finishing touch. The patchouli and sandalwood notes, tempered by sweeter notes like creme brulee and pink peony predominate. All in all it’s a surprisingly lovely fragrance, and definitely worth checking out during your next visit to Saks! Click here to visit Bond No. 9’s site-I LOVE the Lexington Avenue page–so Andy Warhol! Just in time for the 80th anniversary of Andy Warhol’s birthday (August 6, 1928), Bond No. 9 proudly introduces the third in its series of Warhol eaux de parfum. 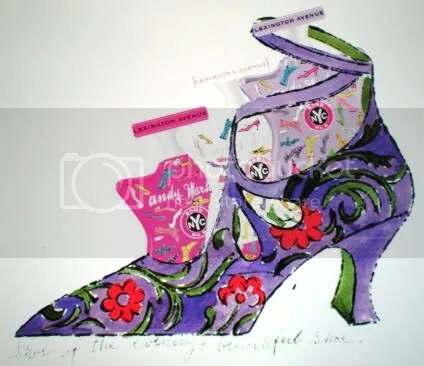 Its name, Andy Warhol Lexington Avenue, recalls the artist’s formative pre-Pop years in 1950s New York, when he lived in the first of several apartments on Lexington Avenue and plied his trade as a prolific illustrator—mainly of imaginative shoes. 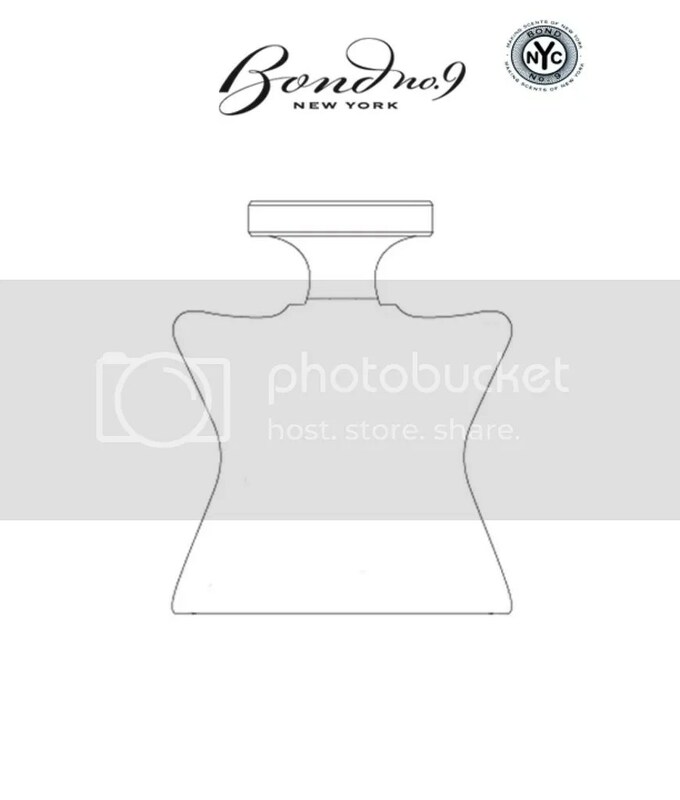 Warhol Lexington Avenue is available in two sizes: 100ml and 50ml, at Bond No. 9’s four New York City boutiques,www.bondno9.com, 877.273.3369, and at Saks Fifth Avenue nationwide. The bottle featured above is actually a Limited-Edition flacon, available for the holiday season, featuring Robert Lee Morris’ sterling shoe pendants of Warhol’s shoe designs on a sterling silver chain ($575). The fragrance sounds interesting, but of course I need to sniff it for myself!